The SunSpec Alliance is a trade alliance of over 70 solar and storage distributed energy industry participants, together pursuing information standards to enable “plug & play” system interoperability. PcVue has achieved “plug and play” Supervisory Control and Data Acquisition (SCADA) for PV Plant and Fleet Monitoring Solutions by leveraging the SunSpec standards. This is accomplished by scanning the Solar Plant network for SunSpec equipment in order to identify the standard models that are located at each IP address. The resulting Modbus map is then used to automatically configure communications in the SCADA to point to relevant information on connected equipment such as inverters, meters, weather stations and storage systems. Using PcVue’s Smart Generator technology, the SunSpec scan is converted to XML that generates SCADA communication objects and graphical user interface faceplates. This functional base SCADA allows monitoring of the equipment information registers and the ability to send set points and update command registers. Trending, alarm generation and historical records of the state of the SunSpec compliant equipment are then selected by the SCADA designer who may also expand on the Human Machine Interface as needed. 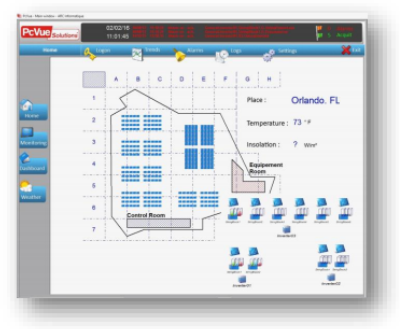 For example, the SCADA designer may add a map display to visualize Solar Fleet assets with live KPI’s displayed for each asset or summarized by Plant. The advantage with this approach is a major reduction of the cost of deployment of the Solar SCADA and elimination of human induced errors when compared to traditional manually configured SCADA. It has the additional advantage that any upgrades or expansion of the Solar Plant may be incorporated by simply rescanning the network.